The last thing I picked up on Record Store Day was definitively not a Record Store Day exclusive. When I go to the record store on this holiest of days, I still look at the rest of the store and do some shopping. I also picked up some clear LP sleeves, but they've proven difficult to take pictures of. 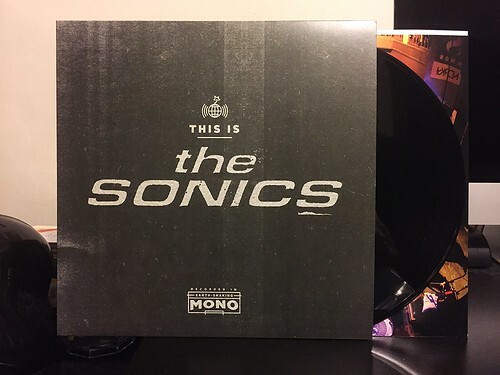 I read a lot about this Sonics record before taking the plunge. A reunion album 50 years after their last full length? Dudes in the band in their 70's? Seems like a recipe for disaster, but The Sonics are still more punk rock than most bands whose members are a third of their age. The Is The Sonics simply rips from start to finish. The chunky guitar riffs and the howling lead vocals of Freddie Dennis are a potent combination. Add in the Circa Now style fog horn saxophone and you'll see that there is a taste of the 60's that pepper these songs. Don't mistake this for a throwback album though, there's a fire and intensity that can only come from guys who have had more time on this planet getting pissed off than most. There isn't a bad song on the album and the hits are plentiful. Every time I listen to this album I pick out a new favorite. The songs that I dig the most tend to be "Don't Need A Doctor," "You Can't Judge A Book By Looking At The Cover," "The Hard Way" and "I Got Your Number." That being said, there really isn't a bad song on the record and it's just a joy to throw on the turntable and crank it up as loud as it goes.